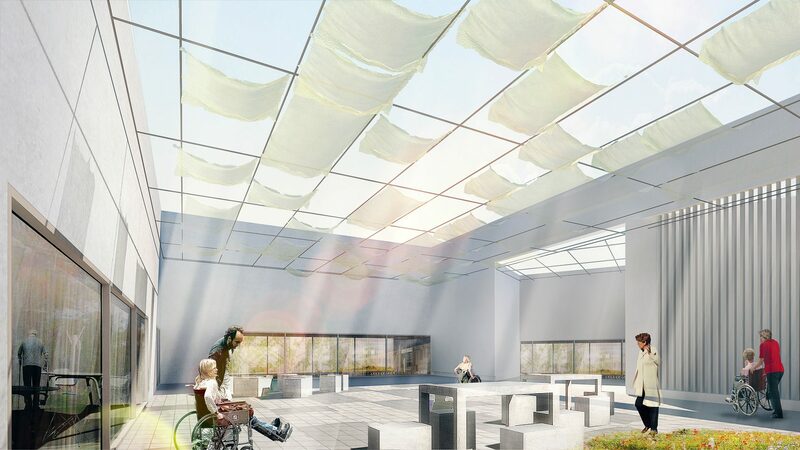 The project for a Care Center in Beersheba aspires to define a new standard of quality services for adults with developmental intellectual and physical disabilities in the region which it serves. This ambitious goal will be achieved by addressing the programmatic needs in phases balancing the need for future growth with a conscientious budgetary approach. The project manifests itself as a series of prismatic volumes programmatically structured on the site so that at each stage of the phasing process the project can be understood in its totality as a single, fully completed entity. Once all phases are completed, the building’s character will not only be retained but will be in fact augmented, successfully functioning both as a whole and as the sum its parts. 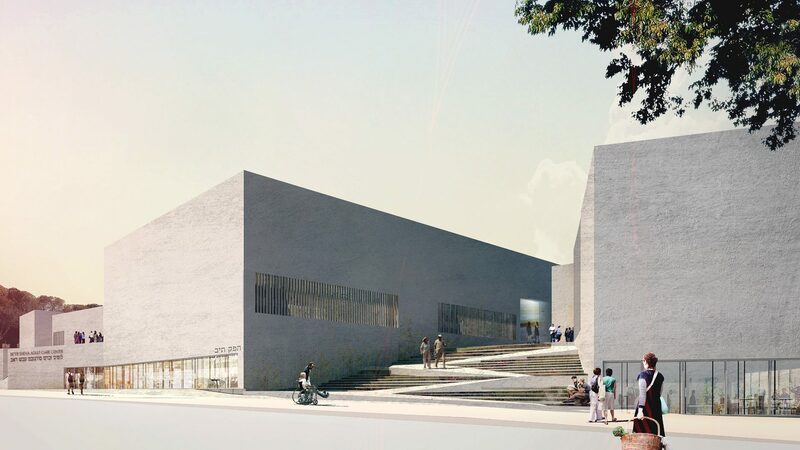 At each execution phase, the Care Center will works seamlessly while comfortably blending with its surrounding by addressing the neighborhood openly while preserving the privacy of patients and patrons. To further the premise of progressive, planned growth, the footprints of the future phases of the project will be present on the site from the beginning by virtue of a series of architectural traces which will subtly suggest the future expansion of the Center. These traces will appear as a forward projection in the form of old remnants of timeless architecture reminding the entire community of the dreams and aspirations of the Care Center in years ahead. 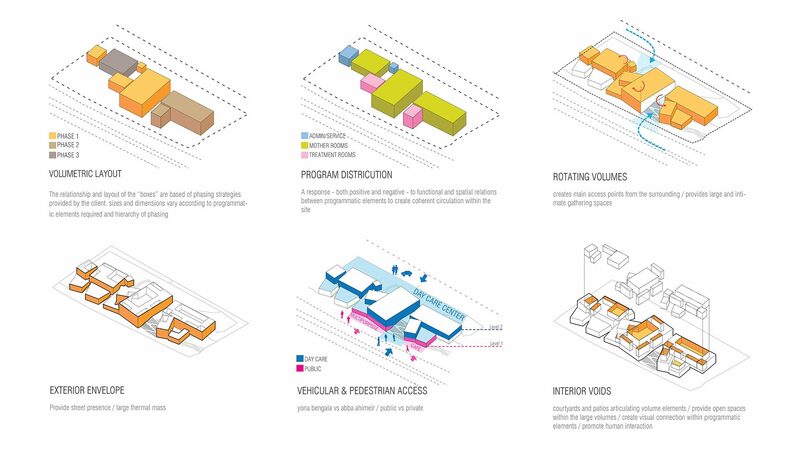 Programmatically speaking, and in response to the desired phasing strategy, each construction phase has been designed to work around the concept of community clusters. 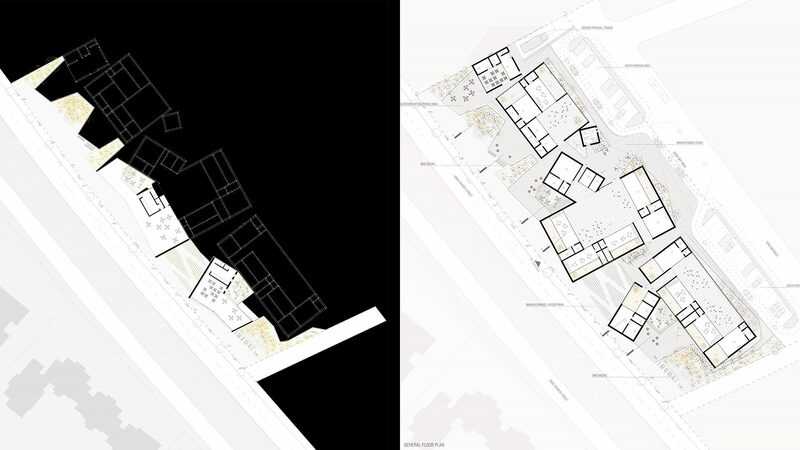 Within these clusters each mother group is organized around a communal courtyard space, designated for common activities within phases creating a direct relationship between this large courtyard and the mother rooms. The relationship between the different mother rooms is both physical and visual allowing for the possibility of interaction when desired but offering to maintain a personal feeling of privacy. From a climatic standpoint, the nursing and therapeutic mother rooms have been designed to promote cross circulation during high temperatures. In the common courtyards overhead canopies partially cover the space providing shading and rain coverage when needed. The arrival and circulation strategy for the Care Center is organized around two main plazas, fed by two main access routes: (1) a pedestrian access from the west and south and (2) a vehicular access from the east. These plazas serve as both distribution hubs and control points from which residents are welcomed and escorted to their specific mother group rooms. The materiality of the project is highlighted by the voluminous stucco walls and the use of storefront glass which creates a strong sense of depth, extending the physical and visual connections throughout the project. 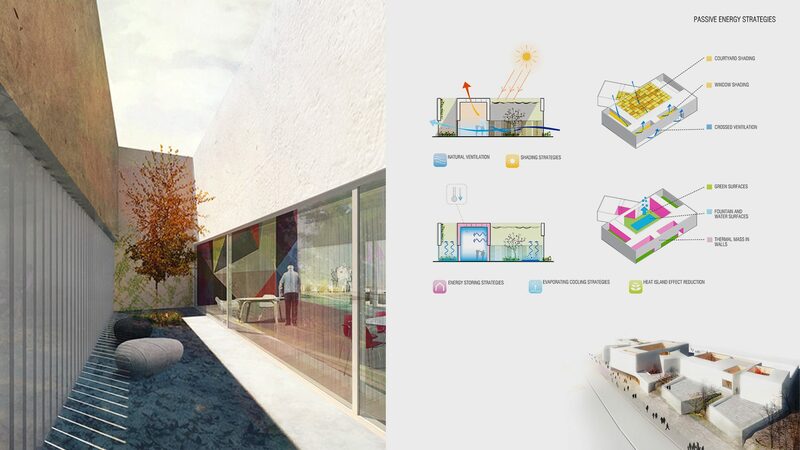 Beyond the building’s programmatic approach, its relationship with the site and the immediate environment which surrounds it, the project’s priority is on the health and well-being of the patients. In our proposal the physical (body), the mental (mind) and the emotional (soul) needs of the individual will be addressed. The light-filled patios and courtyards, the delicate balance of privacy achieved within the building and in subtle relationship of the project to the surrounding neighborhood, are all part of the project’s commitment to establish the patient’s happiness and their caregiver’s satisfaction as the key to the success of the project.